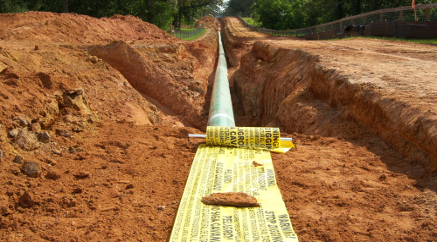 Gas Line, Cathodic & Underground Pipeline Warning Tape | Reef Industries, Inc. Locate, identity and protect gas and oil lines from unwanted dig-ins by installing Terra Tape® underground warning tape over your buried gas lines. This underground warning tape will provide continuous protection, alerting workers to stop digging. Terra Tape® is available in detectable as well as non-detectable grades. Standard APWA color coded yellow tapes are available in a variety of stock imprints that are available for immediate shipment. Custom sizes and/ or printing in any imprint or logo are also available. With minimal installation costs, Terra Tape® underground warning tape will provide maximum protection and will help you avoid dangerous dig-ins and the their consequences. Posted signs rarely prevent dig-ins. 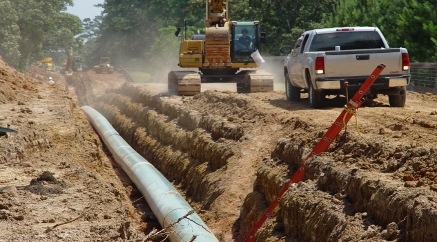 Terra Tape® underground warning tapes are specified the world over as a warning system to protect against accidental dig-ins and to alert workers of underground pipelines. Terra Tape® is an extrusion laminated identification system available in detectable and non-detectable grades and serves as a visual signal that further digging will harm pipelines below. All Terra Tape® underground marking tapes can be custom printed with your name, logo, phone number and/or message in up to four (4) colors. Our products are designed to suit your budget and project requirements. No other product can match the unique benefits found only in Terra Tape® detectable and non-detectable underground warning tape, the protection you can trust. 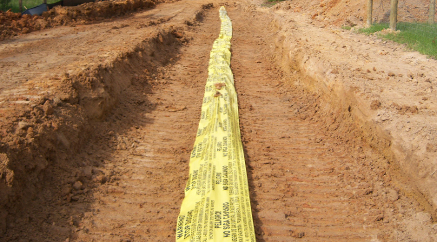 Terra Tape® is an identification system that serves as a durable and visual signal to locate buried lines and protect them from accidental dig ins. APWA color coded yellow underground warning tapes are available in a variety of stock sizes and imprints and are available for immediate shipment. With minimal installation costs, Terra Tape® underground warning tapes will provide maximum protection and will help you save money from unwanted and costly cathodic line damage. Terra Tape's Underground Marking tape is the industry standard for protecting, identifying and locating all types of buried utilities.